“Once again, rock radio has been dealt a blow in New York.” So begins a 290-word item that appeared October 9, 2012, on the New York Times‘s Media Decoder blog. Given the news, “dealt a blow” was a pretty massive understatement: WEMP, the city’s last radio station dedicated to playing contemporary rock music, was to begin simulcasting the AM sports talk station WFAN. It would now be virtually impossible to hear bands under the age of 40 over the airwaves in the nation’s largest media market. Rock radio in the city had been dealt a blow like Hiroshima had a bad day with a loud explosion. At one time, New York City had been the unofficial capital of rock and roll, the place where the Beatles traveled to appear on Ed Sullivan and infiltrate an entire nation’s TV sets; where wannabe arena rock bands received their coronation by filling Madison Square Garden; where Bob Dylan and the Brill Building were nurtured and Lou Reed, the New York Dolls, and the Ramones were birthed. Now the ignoble death of rock radio in the city had been reduced to a matter of administrative paper-shuffling in a dispassionate web post. The change at WEMP was, in a sense, old news. The extinction of rock radio has been a nationwide epidemic dating back to the mid-’00s, when stations in former rock strongholds like Chicago, Philadelphia, Baltimore, and Seattle began slowly filtering new and emerging bands out of their playlists — or changing formats altogether. The Times originally reported on the trend back in 2005, when program directors and station managers put the blame on changing listener habits and, more pointedly, on the music itself. Even the record labels pushing the music admitted that its latest batch of artists — in the words of an anonymous promotion executive — “could be your waiter tomorrow night and you wouldn’t know the difference.” Indifferently promoted product resulted in indifferent ratings: Ratings for the “alternative” rock format in the 18-to-34 age group fell 20 percent in the first half of the ’00s, while audiences for rap, R&B, and Spanish-language formats grew. KROQ’s Kevin Weatherly zeroed in on a dilemma for many rock stations in the ’00s: More rock fans were listening to indie bands, but not enough to sustain strong ratings. And those listeners recoiled at hearing a song by Interpol or Death Cab for Cutie followed by Staind or (gasp!) Nickelback. And the reverse was true for listeners who preferred the heavier bands. The rock audience had been parceled into smaller, less significant constituencies who saw themselves as incompatible with one another. Rock stations had to choose one or the other, diminishing their own stature in the process. In its prime, rock had been used interchangeably with “pop.” It was a catchall term for music intended to be appreciated by millions. Now, rock signified new, uncomfortable truths about the new century: fragmentation of tastes, old-media collapse, demographic shifts favoring women and minorities and freezing out aging white dudes. In the first installment of a new series, we swing the hammer of the gods. How four men in face paint made rock real for a nation. How the hair-metal pretty boys from New Jersey became one of our last legacy rock bands. How a big, bad drug monster begat a big-business rock band. How the ‘Black Album’ changed everything. Even shrinking empires need rulers, and in the ’00s Linkin Park towered over the competition in rock’s dwindling marketplace. Linkin Park’s 2000 debut, Hybrid Theory, was the top-selling rock album of the decade — ranking no. 7 overall — eventually moving more than 10 million units. Linkin Park went on to sell more than 50 million records, due in large part to radio: On rock stations, Linkin Park was a dominant force, lodging 10 no. 1 alternative hits (and five top-10s) between 2001 and 2010. Linkin Park also notched three top-10 hits on the pop charts in the ’00s, peaking with Hybrid Theory‘s standout “In the End,” which went to no. 2 on the Hot 100 in 2001. Linkin Park’s radio popularity is a chicken-or-egg proposition: Was the group a natural for airplay because it effectively mimicked the boilerplate sound of ’00s rock radio — some leftover angst from grunge, a flash of heavy-metal dynamics, a dollop of Sublime’s SoCal bro-rap, a trace of Trent Reznor’s pop-industrial histrionics — or was it radio that conformed to Linkin Park’s warmed-over, edible-enough sludge? Formed in 1996 and based in Los Angeles, Linkin Park is commonly associated with the nu-metal bands of the late ’90s. But it never really belonged with the standard-bearers of that scene; as Korn and Limp Bizkit bum-rushed MTV, Linkin Park spent years struggling to get its act together. Originally known as Xero, the group promptly lost its lead singer after recording an introductory four-track demo for record labels. Xero might have been tossed on the rap-rock scrap heap like so many backward baseball caps had it not hooked up with Chester Bennington, who supplied Linkin Park with the sort of raspy, second-hand Bono-isms that served Scott Stapp and the other bozos in Creed so well.2 The contrast between Bennington’s vocals and co–front man Mike Shinoda’s rapping formed the core of Linkin Park’s new sound. True believers might have looked at Linkin Park as carpetbaggers, but the group’s lack of nu-metal “purity” would actually prove fortuitous in the decade ahead. By the time Hybrid Theory was ready for public consumption, nu-metal was mired in the media scandal of Woodstock ’99. Linkin Park’s timing proved perfect; in sound and presentation, it was the ideal post–Woodstock ’99 band. Hybrid Theory‘s first single, “One Step Closer,” superficially resembled a typical nu-metal song: The scream-y vocals, down-tuned guitars, and record scratches fit the bill. Bennington was intense and vulnerable; he had some stuff to get off his chest, and you better not push him too far, becausehe’sabouttobreak, and blah blah blah. It was music most people over the age of 35 heard only from the other side of a slammed-shut bedroom door keeping the most pissed-off middle schooler on the block from wreaking havoc on the neighbors’ mailboxes. But Linkin Park songs were also catchy, and more melodic than the typical nu-metal band. And the guys in Linkin Park were kind of cute — Bennington, lookswise, had more in common with Justin Timberlake or Nick Carter than the dreadlocked, punishingly tattooed Battlefield Earth extras in Korn. If ever there was a scenario in which Linkin Park invited me to the studio to listen to songs from its new record, I seriously doubt I’d hear anything that would make me say, “That’s the greatest thing I’ve ever heard!” That said, Linkin Park’s music isn’t quite the bucket of rat piss I assumed it was back when I was sprinting in the opposite direction of every nu-metal band in the early ’00s. Let me qualify that lukewarm endorsement: Every Linkin Park LP eventually turns into a slog, particularly the later, more pretentious ones.4 But each album also has at least one track that worms its way into my heart,5 which is the highest praise I can give Linkin Park, because my brain gave my heart explicit orders to not admit any Linkin Park songs. It’s just that Linkin Park’s canniest singles are like expert cat burglars when it comes to pulling B and E’s on my nervous system. Any band that is willing to write more than three dozen choruses in search of the one that’s going to soundtrack the feckless rage of a million sad-faced bros is clearly in it to win it. Linkin Park’s greatest asset isn’t a unique musical vision or game-changing creative genius; it is pop craftsmanship. Linkin Park is very good at making rock songs that are likable without exactly being good. This is the point where Linkin Park’s badass credentials become suspect: It is far too listenable to be a legit nu-metal band. When rap-rock officially assumed the mainstream rock mantle in the late ’90s, it made me feel 100 years old, even though I was a wily codger of 18 at the time. It was the first “youth” music I ever encountered that I immediately knew wasn’t for me. I hated it then, and I don’t much care for it now — though I came to see that people like me hating nu-metal was the whole point of nu-metal. One of the only things classic rock and nu-metal have in common is their huge debt to black music. Fittingly, nu-metal emerged around the time that the blues influence in rock had all but evaporated. The alt-rock bands of the ’90s, like the indie bands of the ’00s, were blindingly white in sound and form. Nu-metal was an attempt by white rock musicians not only to engage with rap music, but to replace an outmoded rock lexicon with the language of hip-hop. In nu-metal, guitarists treated their instruments like turntables, exploring new possibilities for rhythmic noise far beyond the usual 12-bar riffs that had been handed down from ’60s bands cribbing from Howlin’ Wolf and Muddy Waters. The new guitar gods were now stealing from the Bomb Squad. 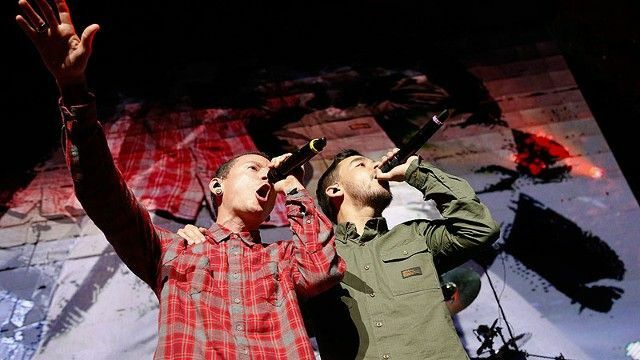 The hip-hop element in Linkin Park’s music had nothing to do with revolutionizing rock music; it was about going with the herd as rap strengthened its hold on pop and R&B in the ’00s. Similar to how grunge bands rushed to pay tribute to their grizzled, rocker-guy heroes, Linkin Park dutifully acknowledged its love of hip-hop on numerous occasions. 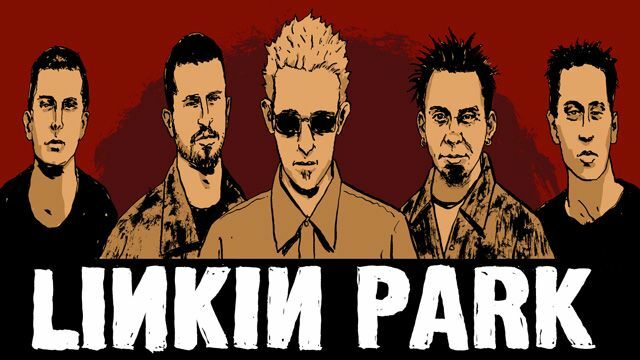 For the Hybrid Theory remix record Reanimation, Linkin Park inserted underground rappers like Aceyalone and Phoenix Orion into the same context as Staind’s Aaron Lewis and Korn’s Jonathan Davis. Somewhat more listenable was the EP Collision Course, a mash-up record with Jay-Z. 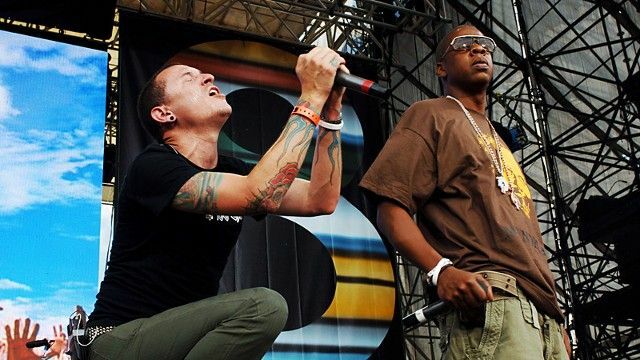 Putting Hova’s rhymes over Linkin Park’s music was hardly flattering to Shinoda’s meager rap skills, but it did shore up the band’s reputation a bit in some crucial areas. Rock and rap had come full circle: Nearly 20 years earlier, Aerosmith had helped Run-D.M.C. cross over to a new audience by appearing on the rap group’s remake of “Walk This Way.”7 Now it was a rock band asking a rapper for a shot of credibility. Speaking as a rock fan who has seen what lies down that road, “problematic” doesn’t even begin to scratch the surface, brother. Coming up in Part 7: We wrap up The Winners’ History of Rock and Roll with the Black Keys, one of the only ’00s indie-rock bands to successfully transition to arena-filling, mainstream stardom. I’ll look at how they did it and whether rock has any hope of regaining its lost share of the pop audience. This is the second-best rock-related Kids in the Hall sketch, after this of course. The most commonly made reference point for Creed is Pearl Jam, but an under-remarked touchstone is Joshua Tree–era U2. This is most obvious in the video for “Higher,” where Scott Stapp looks like a meatier version of Bono from the record’s jacket sleeve photo. The sloggiest, most pretentious Linkin Park record is probably 2010’s A Thousand Suns, which includes song titles like “Jornada Del Muerto,” “Wretches and Kings,” and “Wisdom, Justice, and Love.” It’s like a Muse record without a sense of its own ridiculousness. I am referring to this song.